BLOOD PRESSURE IS THE RESULT OF TWO FORCES: FROM THE HEART AS IT PUMPS BLOOD INTO THE ARTERIES AND THROUGH OUT THE CIRCULATORY SYSTEM/ AND THE FORCE OF THE ARTERIES AS THEY RESIST BLOOD FLOW. ELEVATED BLOOD PRESSURE IS HARMFUL TO THE BODY BECAUSE IT CAUSES THE HEART TO WORK HARDER THAN NORMAL LEAVING BOTH THE HEART AND ARTERIES MORE PRONE TO INJURY. HIGH BLOOD PRESSURE INCREASES RISK OF HEART ATTACK, STROKE, DAMAGE TO EYES, KIDNEY FAILURE, ASTHEROSCLEROSIS, AND CONGESTIVE HEART FAILURE(CHF). HIGH BLOOD PRESSURE WITHOUT TREATMENT CAN MAKE THE HEART WORK HARDER TO PUMP ENOUGH BLOOD AND OXYGEN(O2) TO THE BODY'S ORGANS AND TISSUE. OVER WORKED HEART FOR A EXTENDED PERIOD OF TIME TENDS TO ENLARGE AND WEAKEN. ARTERIES ALSO SUFFER, THEY BECOME SCARRED, HARDENED, AND LESS ELASTIC OVER TIME. HIGH BLOOD PRESSURE IS OFTEN CALLED "THE SILENT KILLER" BECAUSE IT USUALLY HAS NO SYMPTOMS. 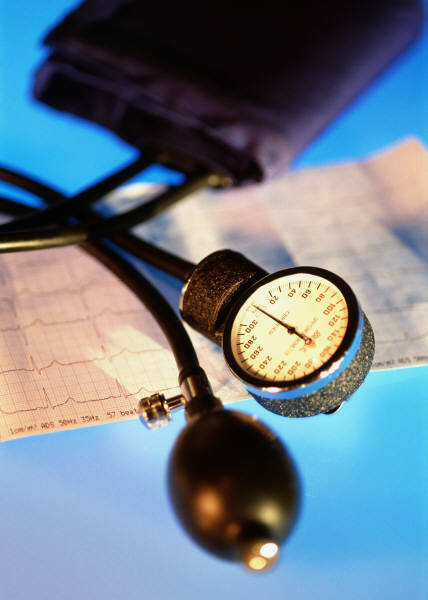 THE ONLY WAY TO KNOW IF YOU HAVE ELEVATED BLOOD PRESSURE IS TO GO GET IT CHECKED. SYSTOLIC PRESSURE IS READ FIRST. SYSTOLIC PRESSURE IS WHEN THE HEART CONTRACTS. DIASTOLIC PRESSURE IS READ SECOND. DIASTOLIC PRESSURE IS WHEN THE HEART IS RELAXED. NORMAL ADULT PRESSURE IS 120/80 (BLOOD PRESSURE IS MEASURED IN MILLILITERS OF MERCURY OR MM HG). 140/90 AND ABOVE IS CONSIDERED HIGH BLOOD PRESSURE. CAUSES OF HIGH BLOOD PRESSURE COULD BE BY RACE, HEREDITY, DIABETICS, OVERWEIGHT, AGE, ETC. TREATING HIGH BLOOD PRESSURE COMES IN VARIETIES SUCH AS LOSING WEIGHT, QUIT SMOKING/ALCOHOL, LOW-FAT DIET, AND MEDICATIONS.